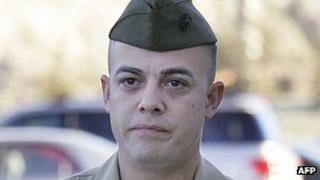 The final US marine to face charges over the killing of unarmed Iraqi civilians in Haditha in 2005 has pleaded guilty to dereliction of duty. Sgt Frank Wuterich was one of eight marines charged with murder or failure to investigate the killings, but now faces just three months in jail. The charges against six were dropped or dismissed, and one was acquitted. Sgt Wuterich reached a plea deal to bring an end to the most notorious case against US troops from the Iraq war. Before the plea, he faced several counts of manslaughter. He is expected to be sentenced on Tuesday. Sgt Wuterich's guilty plea ended an ongoing trial at Camp Pendleton, California, almost seven years after the events in question. Prosecutors argued that on the day of the killings Sgt Wuterich lost control after seeing a friend blown apart by a bomb, before leading the soldiers under his command on a rampage. Among the dead were women, children and elderly people, including a man in a wheelchair. His former squad members testified during the hearings that they did not receive any incoming gunfire during nor find any weapons at the scene of the killings. His defence said he did the best he could in the "fog of war" and that his squad truly believed they were on a search for insurgents. The dropping of nine manslaughter charges against Staff Sergeant Frank Wuterich, 31, and the relative leniency of a maximum three month jail sentence will not be well received by those in Iraq who wanted justice for the death of family members. Especially after all other cases related to the killings have been dropped or acquitted. The killings severely tainted the reputation of US forces in Iraq, but by 2005, they had already been hit hard by the prisoner abuse at Abu Ghraib. The Haditha massacre is still an emotive issue in the country and prompted calls for US troops to be denied immunity from prosecution in the Iraqi justice system. Soon after, US Marines ordered their troops to attempt to distinguish between civilians and combatants. Several of them said that they feared insurgents were hiding nearby and they had not done anything wrong by opening fire. While the events in Haditha occurred in November 2005, an investigation did not begin until a local human rights activist went public with video footage of the aftermath. A subsequent investigation by Time magazine suggested that most of the dead were shot by marines - and in March 2006 a criminal investigation was begun. The following month, three officers in charge of troops in Haditha were stripped of their command and reassigned. Sgt Wuterich's trial was delayed for years by debate between the defence and prosecution - including whether or not they could show previously unseen footage from a 60 Minutes interview he gave to US network CBS in 2007. After being dubbed "the butcher of Haditha", Sgt Wuterich said he had consented to the interview because he wanted the truth to come out after being called a "monster" and a "baby killer". Prosecutors eventually won the right to show the entire interview. The Haditha killings were cited as a key reason why Iraqi officials refused to give US troops immunity from their court system. That sticking point helped contribute to the eventual pullout of US troops from Iraq at the end of 2011.